Analog Artist Digital World: Beau and Arrow: Crash Landing at Fringe. A Little Bit Off, from Portland, Oregon presented Beau and Aero: Crash Landing, a show featuring a whirlwind of acrobatic and slapstick antics. Pilot Beau and his sidekick Aero,two bumbling aviators,have crash landed, and will try anything to get back in the air. These foolish pilots live in a world where balloons are bountiful, laughs are abundant, and hardly a word is spoken. After hearing a plane crash in the darkness of the theater, Beau stumbled out wrapped inside a parachute. A rag doll version of Arrow was thrust up and over a black backstage curtain. The house went black Beau tried to revive his side kick. she was fine, but playfully slid back to a reclined position any time Beau turned his back. Much of the involved playful uses for balloons. Beau offered a balloon to a young girl in the audience and right before she grabbed it, he let go ad the balloon spit out air and flew away in s spiraling trajectory. A woman picked from the audience held a fool wide hoop which Beau shoot a sputtering balloon through. The balloons always flew off course. Somehow a ping pong ball was thrust inside arrow's balloon. She squeezed the balloon and it shot the ping pong ball right into Beau's chest. He then went into slow sequence in which he acted out his horror ad shock about being shot. He stumbled over to the woman from the audience, and she held him much like the Pieta as he faded away. The sweat on Beau's brow reminded me that all the antics aren't easy. As a giant 5 foot high red balloon was inflated, the audience was covered with the parachute. Amazingly both Beau and arrow crawled inside the balloon. 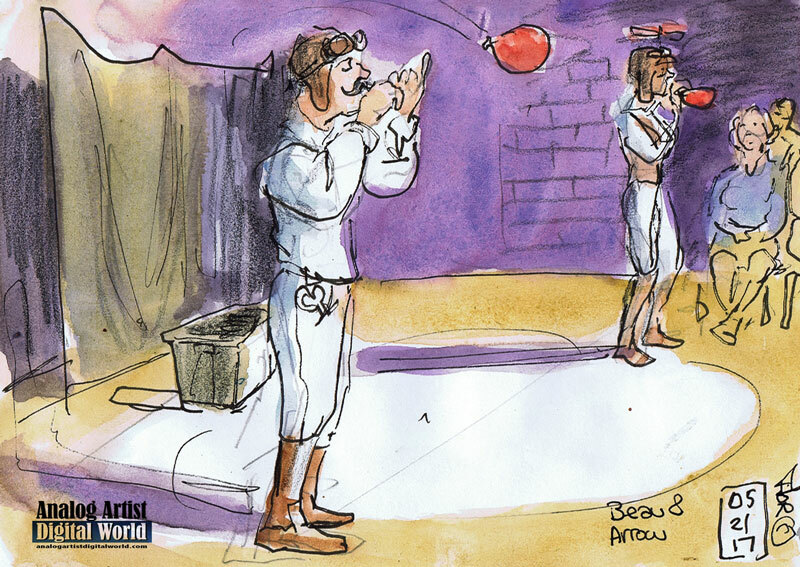 The audience was warned that there would be a loud noise, and the balloon popped To show that Beau and Aero had both changed into brightly colored acrobat's jump suits. It is rare for a show to make me feel a child like wonder, but Beau and Arrow accomplished that. Sunday May 28, 2017 at 4:30pm in the Green Venue 1001 East Princeton Street Orlando FL.